However, orchestra musicians' hearing is apparently better than what their exposure to sound would suggest. Arnold and Miskolczy-Fodor  found no hearing loss among 30 professional pianists, and indeed, few studies have found changes in audiogram readings which could be interpreted to have been caused by exposure to sound, and whatever changes have been found are small. Westmore and Eversden  found hearing loss in 23 of 68 ears, but this hearing loss was greater than 20 dB in only four of them. Royster et al. measured the noise exposure and hearing thresholds of Chicago Symphony Orchestra musicians and found the sound levels to be at 75-95 dB(A), corresponding to an 8-h daily Leq , and although the musicians' mean hearing thresholds of 59 dB were better than those of an unscreened non-industrial population, 52.5% of the individual musicians showed notched audiograms consistent with NIHL. When testing the hearing of musicians with high-frequency audiometry, Johnson et al. found no difference between 60 musicians and 30 subjects from a non-noise-exposed population. When comparing musicians in the same orchestra, McBride et al. found that those musicians exposed to a higher level of sound had greater hearing loss than those exposed to lesser levels. Axelsson and Lindgren  measured the sound levels in two theaters and the hearing thresholds of 139 musicians and found that the sound levels varied from 83 to 92 dB(A), with the highest levels being in the orchestra pit, and that 59 musicians had worse hearing than usual for their ages. However, Jansson and Karlsson  and Kδhδri et al. found that the hearing of orchestra musicians does not differ from the hearing of the normal, non-exposed population. The purpose of the study was a) to evaluate the risk of NIHL among orchestra musicians, b) to compare the observed NIHL to the prediction of ISO 1999 (1990), and c) to find the role of individual susceptibility factors in the onset of hearing loss among orchestra musicians. The sample consisted of the members of four major orchestras from the Helsinki metropolitan area, the National Opera Orchestra, the Tapiola Sinfonietta Symphony Orchestra, the Radio Symphony Orchestra, and a military brass band called the Guards. Inclusion in the sample was based on voluntary participation, the subjects' audiometry corresponding to normal NIHL audiometry with the notch at 3-6 kHz, and their having no ear or central nervous system (CNS) infections. 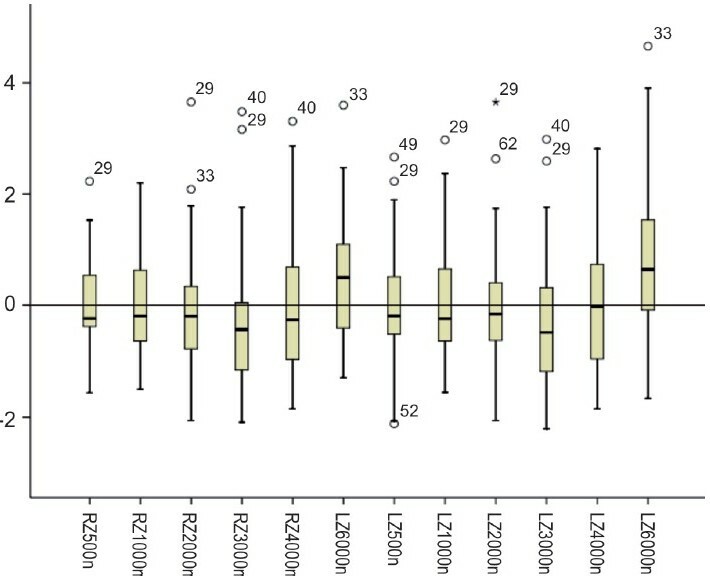 Altogether, 67 musicians participated in the study, of whom we excluded four because of their audiometer form, with 38 males with a mean age of 41 ± 9 years, and 25 females with a mean age of 40 ± 6 years. We informed the members of the sample about the purpose of the study before presenting them with the questionnaire. We measured the audiograms using a Madsen Midimate 602 clinical audiometer, starting with the subjects' right ears in the sequence of 1000, 2000, 3000, 4000, 6000, 8000, 500, and 250 Hz, and then repeating the process with their left ears. We conducted all audiometer measurements in the audiometric booth of the occupational-health care unit except for the members of the Guard band, in whom we measured in a booth at the Finnish Institute of Occupational Health. We obtained this study's data about the presence of tinnitus and hyperacusis after rehearsals and performances with questionnaire items with a 5-point Likert scale of never, seldom, sometimes, often, always. where Tpr = time spent in personal rehearsals (hours/8), Tgr = time spent in group rehearsal (hours/8), Tp = time spent in performances (hours/8), T = 1500 h = average working hours/year, LAeq,p = mean A weighted noise level in performances, LAeq,pr = mean A weighted noise level in personal rehearsals, and LAeq,gr = A weighted mean noise level in group rehearsals. , where x = the observed threshold shift, μ = expected mean threshold shift obtained from ISO 1999-1990 database A, and σ = standard deviation of the threshold shift obtained from ISO 1999-1990. The ISO 1999-1990 models consist of two Gaussian distributions, one for over the 50th percentile and another for under the 50th percentile. Age, gender, and noise exposure are the input parameters. As a result, the Z-score distribution of observed threshold shifts has zero means and standard deviations of one. We applied the Z-scoring to the audiograms twice. To compare the musicians' hearing to the hearing of the non-noise-exposed population, we set the noise-exposure term to zero. We inserted the noise-exposure term in the second transformation, which enabled comparison to noise-exposed industrial workers. We calculated the Z scores using Matlab 7 rev 3, made by Mathworks Inc., USA, and sent the results to SPSS 17, made by SPSS Inc., USA. We then made the comparisons using t-test and analysis of variance (ANOVA). [Table 2] shows the results of the sound exposure measurements. 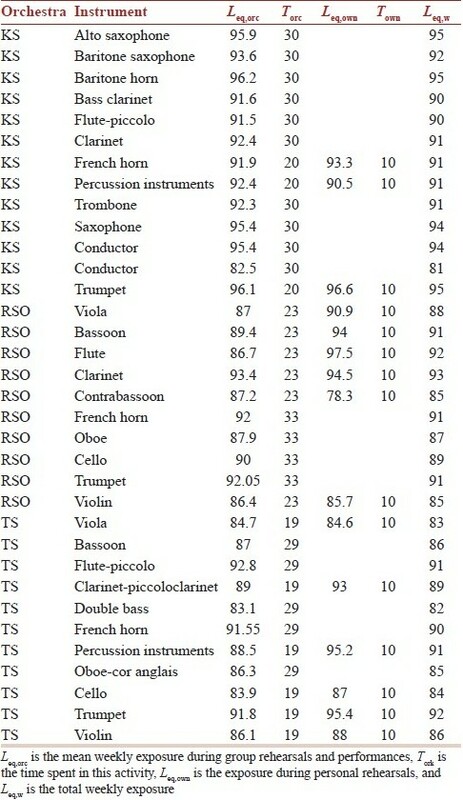 Most of the musicians are exposed to sound levels over 90 dB (A). Those in the Guard band received the highest exposure and those in the Tapiola Sinfonietta, the smallest orchestra, received the lowest. 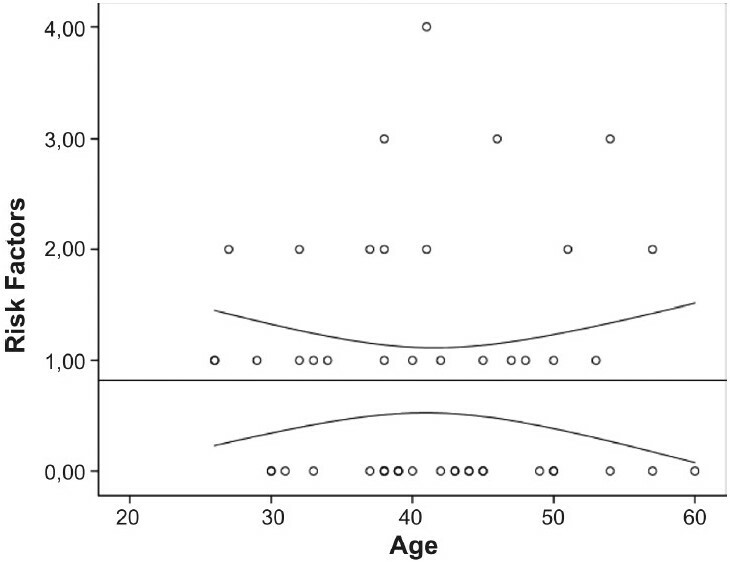 The exposure time was long, with 12% of the subjects having started their professional career before age 20 years, the mean starting age being 23 years. The total exposure was somewhat higher among men (101.5 ± 5.3 dB) than among women (98 ± 5 dB). The difference was due to higher weekly exposure (90 ± 5 dB vs. 87 ± 3 dB) and longer exposure time (19 ± 101 vs. 15 ± 8). The mean hearing loss was remarkably symmetric, but somewhat higher in the left ear [Figure 1]. The hearing loss was tuned to the higher frequencies, which is typical for NIHL and presbycusis. The greatest hearing loss was typically found at 6 kHz, as shown in [Figure 1]. To test whether this hearing loss depends on exposure, we divided the musicians into a high-exposure class (Lex > 100) and a low-exposure class (Lex < 100). In the high-exposure class, the age-corrected hearing loss was significantly higher in both the ears at frequencies of 1000-6000 Hz except for the left ear at 4000 Hz where only a trend (P<0.07) was seen. The results are shown in [Table 3]. The exception in the right ear at 4 kHz is probably due to the relatively large variation at this frequency. Comparing the musicians to a non-exposed population using Z-scoring revealed that their hearing loss corresponded to the expected hearing loss of that non-exposed population, except for at 3000 and 6000 Hz. At 6000 Hz, the hearing loss was higher than predicted, as shown in [Figure 2]. 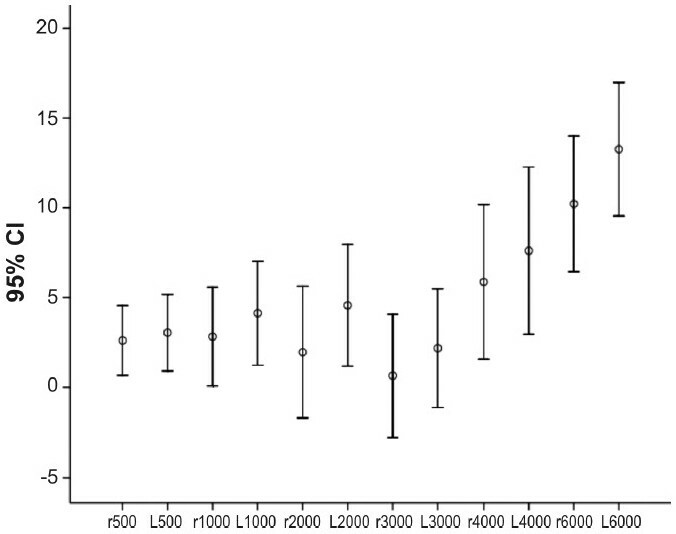 The musicians' hearing loss can be seen to be smaller than expected for the frequencies of 2000, 3000, and 4000 Hz (P< 0.04), with an expected value of 6000 Hz (NS), when compared to an industrial population also having had lifetime exposure, as shown in [Figure 3]. Tinnitus and hyperacusis were relatively frequent, as shown in [Table 4], with 60% of the musicians having never or seldom experienced tinnitus after group rehearsals and performances. A greater number (78%) reported never or seldom experiencing it after personal training. Only 16% of the musicians reported never having experienced hyperacusis. The musicians' mean systolic blood pressure was 127 ± 13 mmHg, and their mean diastolic blood pressure was 80 ± 10 mmHg. Their mean cholesterol value was 4.8 ± 0.8. We also found that 12% of the subjects were current smokers, 2% were former smokers who had stopped, and 10% had used painkillers regularly for more than 5 years. 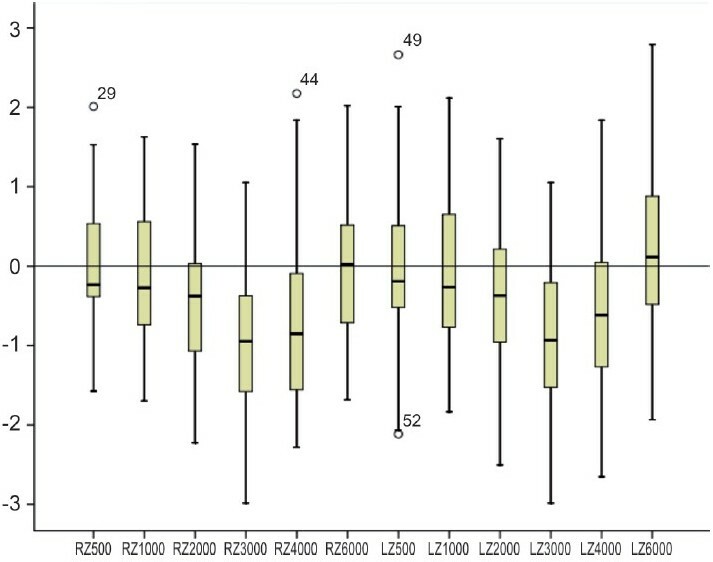 The number of risk factors also increased with age, as shown in [Figure 4], with the regression line at 0.0875 + 0.0001 × age. The expected number of risk factors was therefore one at the age of 60 years, and their hearing did not depend on the number of risk factors, mostly because only 8% of the subjects had three or more of them, which made the high-risk group too small for comparison. The issue of whether musicians tend to have NIHL has been debated for a long time. This study found that orchestra musicians' hearing loss corresponds to that of the non-noise-exposed population, according to ISO-1999. However, it also found that the extent of hearing loss depends on the degree of exposure to high-volume sound, similar to what Kuronen et al. found for military pilots. NIHL is a complex disorder that is influenced by both environmental and genetic factors. As such, it varies considerably between individuals. The environmental factors involved in NIHL have been studied relatively extensively. Noise itself is the most studied and best-documented environmental factor causing hearing loss, as it can cause mechanical damage, exert metabolic effects on the inner ear, or both. , Co-exposure to organic solvents and heavy metals is among the environmental factors known to cause a raised susceptibility to noise. Authors ,,,, found a synergistic effect between noise exposure and exposure to chemicals in laboratory animals. Such additional environmental factors as ototoxic substances, drugs, heat, nutrient disturbances, and vibrations can also influence susceptibility to NIHL. Furthermore, studies such as that of Toppila et al. have found that individual factors such as smoking, elevated blood pressure, and cholesterol levels may influence the degree of NIHL. This study sample's low degree of NIHL can therefore be explained by the presence of a non-hostile working environment and various individual factors. The musicians' working environment has no ototoxic chemicals or vibrations, which is an indication that it is relatively friendly. Their number of individual risk factors is small and we observed no age dependency. Age dependency is high for blue-collar workers and small for military pilots. This leaves the major question of why the number of risk factors is so low, and it seems reasonable to speculate that this may be due to the nature of the work. Musicians need to concentrate intensely during all performances, which in turn requires physical fitness, creating an incentive for regular, healthy life habits, as this study's finding of a low number of risk factors among them has shown. At sound-pressure levels (SPLs) of less than 125 dB, sound-induced overstimulation and overactivity of the cochlea can result in disturbed cochlear homeostasis and subsequent functional impairment in the absence of direct and immediate mechanical damage. Experimental evidence suggests a critical level about 125 dB SPL, at which the cause of damage changes from predominantly metabolic to mechanical. Tinnitus, however, is more common among people exposed to such impulsive noise as music. Impulsive noise's high peak levels indicate that mechanical damage plays an important role in the etiology of tinnitus. It is reasonable to assume that risk factors affect the effects of metabolic trauma but not those of mechanical trauma, which could explain the low prevalence of NIHL and the high prevalence of tinnitus among musicians. Taking into account the risk of hearing loss, tinnitus, and other symptoms, the use of hearing protectors would seem to be justified. Musicians have said that their main reason for using them is a fear of hearing loss and tinnitus,  but they also used them to avoid pain, to protect their ears from fatigue, to decrease stress, irritation, and fatigue, and due to existing hearing loss and tinnitus. However, it seems that for many of the problems created by wearing hearing-protection devices, especially such devices' effect on their performances were worse than their fears of hearing loss, a factor which limits their usage of such devices. Musicians have reported that having existing hearing loss especially makes the use of hearing protectors difficult. It would therefore be advantageous for musicians to start wearing hearing protectors as early as possible, especially before symptoms appear. The hearing of classical musicians corresponds to that of the non-noise-exposed population according to ISO-1999:1990. Hearing loss is nevertheless dependent on exposure to noise, and classical musicians do suffer from a high rate of tinnitus and hyperacusis. Their low noise susceptibility is due to a low incidence of risk factors and is probably due to a low rate of exposure to negative environmental factors. 1. Laitinen HM, Toppila EM, Olkinuora PS, Kuisma K. Sound exposure among the Finnish National Opera personnel. Appl Occup Environ Hyg 2003;18:177-82. 2. Lataye R, Campo P, Loquet G. Combined effects of noise and styrene exposure on hearing function in the rat. Hear Res 2000;139:86-96. 3. Lebo CP, Oliphant KP. Music as a source of acoustic trauma. Laryngoscope 1968;78:1211-8. 4. Arnold GE, Miskolczy-Fodor F. Pure-tone thresholds of professional pianists. AMA Arch Otolaryngol 1960;71:938-47. 5. Westmore GA, Eversden ID. Noise-induced hearing loss and orchestral musicians. Arch Otolaryngol 1981;107:761-4. 6. Royster JD, Royster LH, Killion MC. Sound exposures and hearing thresholds of symphony orchestra musicians. J Acoust Soc Am 1991;89:2793-803. 7. Johnson DW, Sherman RE, Aldridge J, Lorraine A. Effects of instrument type and orchestral position on hearing sensitivity for 0.25 to 20 kHz in the orchestral musician. Scand Audiol 1985;14:215-21. 8. McBride D, Gill F, Proops D, Harrington M, Gardiner K, Attwell C. Noise and the classical musician. BMJ 1992;305:1561-3. 9. Axelsson A, Lindgren F. Hearing in musicians: surprisingly many have worse hearing than expected. Lakartidningen 1982;79:3674-80. 10. Jansson E, Karlsson K. Sound levels recorded within the symphony orchestra and risk criteria for hearing loss. Scand Audiol 1983;12:215-21. 11. Kähäri KR, Axelsson A, Hellström PA, Zachau G. Hearing development in classical orchestral musicians: a follow-up study. Scand Audiol 2001;30:141-9. 12. Axelsson A, Eliansson A, Israelson B. Hearing in pop/rock musicians: a follow up study. Ear and Hearing 1995;16:245-53. 13. Buren M, Solem BS, Laukli E. Threshold of hearing (0.125-20 kHz) in children and youngsters. British Journal of Audiology 1992;26:1:23-31. 14. Hellström PA. The effects on hearing from portable cassette players: a follow-up study. J Sound and Vib 1991;151:461-9. 15. Laitinen H. Factors affecting the use of hearing protectors among classical music players. Noise Health. 2005;7:21-9. 16. Pyykkö IV, Toppila EM, Starck JP, Juhola M, Auramo Y. Database for a hearing conservation program. Scand Audiol 2000;29:52-8. 17. Toppila E, Pyykko I, Starck J. Age and noise-induced hearing loss. Scand Audiol 2001;30:236-44. 18. ISO 1999. Acoustics: determination of occupational noise exposure and estimation of noise induced hearing impairment. Geneva: International Organization for Standardization; 1990. 19. Kuronen P, Toppila E, Starck J, Pääkkönen R, Sorri MJ. Modelling the risk of noise-induced hearing loss among military pilots. Int J Audiol 2004;43:79-84. 20. Mulroy MJ, Henry WR, McNeil PL. Noise-induced transient microlesions in the cell membranes of auditory hair cells. Hear Res 1998;115:93-100. 21. Pujol R, Puel JL. Excitotoxicity, synaptic repair, and functional recovery in the mammalian cochlea: a review of recent findings. Ann NY Acad Sci 1999;884:249-54. 22. Johnson AC, Juntunen L, Nylen P, Borg E, Hoglund G. Effect of interaction between noise and toluene on auditory function in the rat. Acta Otolaryngol 1988;105:56-63. 23. Johnson AC, Nylen P. Effects of industrial solvents on hearing. Occup Med 1995;10:623-40. 24. Sliwinska-Kowalska M, Zamyslowska-Szmytke E, Szymczak W. Effects of coexposure to noise and mixture of organic solvents on hearing in dockyard workers. J Occup Environ Med 2004;46:30-8. 25. Borg E, Canlon B, Engström B. Noise-induced hearing loss. Literature review and experiments in rabbits. Morphological and electrophysiological features, exposure parameters and temporal factors, variability and interactions. Scand Audiol Suppl 1995;40:1-147. 26. Ulehlova L. Stria vascularis in acoustic trauma. Arch Otorhinolaryngol 1983;237:133-8. 27. Scheibe F, Haupt H, Ludwig C. Intensity-dependent changes in oxygenation of cochlear perilymph during acoustic exposure. Hear Res 1992;63:19-25. 28. Alberti P. Tinnitus in occupational hearing loss: nosological aspects. J Otolaryngol 1987;16:34-5. 4 Presbycusis, part 1: Can you hear the music of life? Hutchison, B. and Covan, E.K. and Bogus, J.C. Guest, M., Boggess, M., Attia, J.
Sliwinska-Kowalska, M. and Davis, A.
OæBrien, I. and Driscoll, T. and Ackermann, B.
Derebery, M.J. and Vermiglio, A. and Berliner, K.I. and Potthoff, M. and Holguin, K.
Poissant, S.F. and Freyman, R.L. and MacDonald, A.J. and Nunes, H.A. Pawlaczyk-Łuszczyńska, M., Dudarewicz, A., Zamojska, M., Śliwinska-Kowalska, M.
Schmidt, J.H., Pedersen, E.R., Juhl, P.M., Christensen-Dalsgaard, J., Andersen, T.D., Poulsen, T., Bælum, J.